Airborne m2s: (born 2000) dam of Wind Shear m2s (see below). Ulysses m2s: (born 2001) approved stallion; international Grand Prix showjumper with his half-owner, the Belgian Young Rider Rossella de Simone; 2006 Cavan (Ireland) 5-Year-Old Indoor Showjumping Champion with Irish rider Clem McMahon; 2005 Champion at the Euregio Denekamp Stallion Show (Netherlands) with Dutch rider Eddie Brinkman; and sire of Millfield Ultymate, Advocate m2s, Antrim Coast m2s, and Dedalus m2s (see below). Ultrasonic m2s (born 2001): 1.20 m. showjumper in Ireland and then sold and exported. Una Bella m2s: (born 2001) dam of Ana Bella m2s (see below). Irish 77 AKA Elvis the King m2s and Diamond Toby (born 2002): international showjumper; national Grand Prix showjumper, 2008 Millstreet 6-Year-old Champion, and represented Ireland at both the 2008 & 2009 FEI World Breeding Championship for Young Jumping Horses. Now competing successfully at 1.40 m. and Grand Prix in the USA. Conspiracy m2s: (born 2002) approved stallion; national level showjumper with Eddie Brinkman and eventing horse with Katie O'Sullivan. Confident m2s: (born 2002) international eventer CIC* in 2010 with Lucienne Elms. Vector m2s: (born 2002) Grade C showjumper in Great Britain and jumped 1.30 m. classes with Stacey Babes; now jumping smaller international classes with Italian junior rider Federica Venturi. Contango m2s: (born 2002) eventing in England at BE 90 level with Alison Newton. Condessa m2s: (born 2002) dam of Millfield Ultymate (see below). Wang Chung m2s: (born 2003) approved stallion ridden by Eric Lamaze September 2011 - 2013: many international wins and placings and the #1-ranked Irish-bred international showjumper in 2013; January 2009 - September 2011: international 1.50 m. showjumper, multiple German Grand Prix winner, and Vice-Champion of France's "Future Elite" international showjumping series with German rider Felix Hassmann; 2008 CSI** Zwolle "Future Stallion" Showjumping Champion with Dutch rider Eddie Brinkman. Selected to represent Germany at the 2010 FEI World Breeding Championship for Young Jumping Horses. Wind Shear m2s: (born 2003) international Grand Prix-winning showjumper. Winona O m2s (originally registered as Winona Ryder m2s) (born 2003): Jumping 1.45 Grand Prix and Puissance in the USA. Dam of Celtic Lady m2s (see below). Fernhill m2s (originally registered as Confidant m2s) (born 2003) international eventer CCI** and CIC*** and national CNC*** eventer with Fraser Duffy; represented Portugal at the 2009 FEI World Breeding Championship for Young Eventing Horses with Duarte Seabra; 3rd in the CNC* Michael Leonard Memorial 5- & 6-Year-Old Memorial Championship; in 2010 competing in CNC** and CIC** (Intermediate) with Sophie Richards and represented Ireland at the CCI** 2010 FEI World Breeding Championship for Young Eventing Horses. Winner of 2013 Team Bronze Medal with Michelle Kenny at the 2013 FEI European Young Rider Eventing Championship. The Reprieve (originally registered as Conundrum m2s): (born 2003) international eventer CIC* in 2010. Ardfield Lightening: (born 2003) international eventer CIC* in with Irish rider Aoife Clark (this horse is a full-brother to the international showjumper Irish 77). Nothing Concluded: (born 2003) novice-level eventing horse with Christa George. Concordia m2s: (born 2003) dam of Ballistic m2s (see below). Zorriola m2s (originally registered as Zaftik m2s): (born 2004) 2009 Champion of the KWPN-NA ISF Cup for 5-Year-Old Jumpers in North America; in 2010 jumping 1.30 m.
Ziggy Marley m2s: (born 2004) evented at pre-novice level with Irish international rider Katie O'Sullivan and now competing with half-owner Caroline Regitze Jensen, a Danish young rider. 4th in CIC* Danish Young Rider Championship in 2015. Zeitgeist m2s (born 2004): 1.10 m. showjumper in Ireland and sold and exported to the UK; now showjumping 1.20 - 1.25 with British junior rider Tabitha Sleap. Zeitgeist II m2s (born 2004): 1.20 m. showjumper with British junior rider Tiffany MacTaggart. Millfield Ultymate: (born 2005) 2012 showjumping international Grand Prix; 2011 represented Great Britain at the FEI World Breeding Championship for Young Jumping Horses; 2010 selected to represent Great Britain at the FEI World Breeding Championship for Young Jumping Horses (did not go); 2010 Vice-Champion 5-Year-Old British Young Horse Showjumping Championship; 2009 Joint-Winner of the 4-Year-old British Showjumping Championship; competing in international 1.50 and 1.55 m. classes. Advocate m2s: (born 2005) international eventer CIC* in 2011 with British Team member Nicola Wilson. Ahsianita m2s: (born 2005) Competing in national classes in the USA and won Bronze in the 2013 FEI Group IV (North America/Caribbean) Young Riders Challenge Championship in Wellington, Florida after having produced two foals for her owner. Ana Bella m2s: (born 2005) KWPN-NA Ster mare; 2009 Champion of the KWPN-NA ISF Cup for 4-Year-Old Jumpers in North America; 2010 Vice-Champion of the KWPN-NA ISF Cup for 5-Year-Old Showjumpers in North America; National Top 5 and First Premium Mare in KWPN-NA inspection. A Kept Woman m2s: (born 2005) half-sister to Bada Bing m2s and Asian Tiger m2s, and a Grade C showjumper at 1.20 m. with junior rider Aimee Wood now retired to stud. Antrim Coast m2s: (born 2005) competing in 1.30 m. showjumping, dressage, and eventing classes in Ireland with young rider Melanie Zoe Geddis. 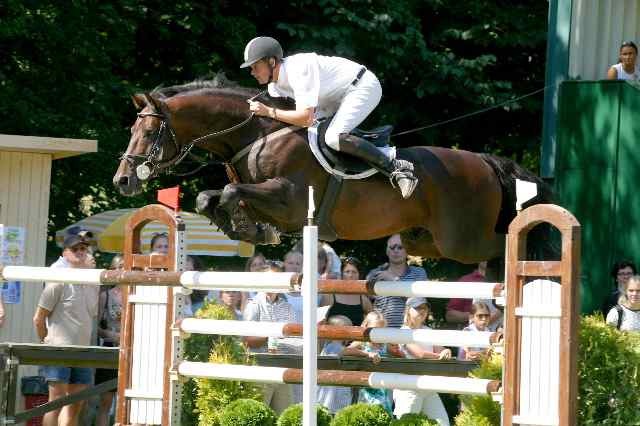 Ballistic m2s: (born 2006) approved stallion; passee stallion performance test in Germany; began showjumping in Germany in 2011 with Lars Rethemeier; showjumped internationally with Swiss rider Clarissa Crotta. Boy Toy m2s: (born 2006) approved stallion; passed stallion performance test in Germany; half-brother of The Reprieve/Conundrum m2s. Best Man m2s (born 2006): showjumping at 1.20 m. in Ireland. Bodessa m2s: (born 2006) in 2012 began showjumping in Ireland and is now competing in 1.30 m. classes and international classes. Celtic Lady m2s (born 2007): showjumping 1.40 m. classes with her owner Cady Klimas. According to the KWPN she was the 5th best 7/8-year-old showjumper in the USA in 2014; according to the US Hunter Jumper Association she was the 11th best 7-year-old of any breed. Dedalus m2s: (born 2008) showjumping in international young horse classes and 1* international Grand Prix in France with his owner, British international rider Louise Morley. A-Rod m2s: (born 2009) showjumping in France. Ai Qing m2s: (born 2009) approved stallion showjumping in Germany. Ai Weiwei m2s: (born 2009) approved stallion. Asian Tiger m2s (born 2009) approved stallion. "Morningside Stud's mission is to breed and compete international Grand Prix / 4* competition horses for the Olympic disciplines of showjumping and eventing by crossing world-class warmblood sires with mares that possess outstanding performance bloodlines and athleticism; to compete our stallions in international showjumping and eventing; and to sell outstanding horses to international riders, sponsors, competition stables, and excellent breeders throughout the world." Our stallions were born into the Holsteiner, KWPN, Selle Francais, Anglo-European, Irish Warmblood, and Irish Sport Horse studbooks and they are approved by over a dozen studbooks throughout Europe, North America, Australia and New Zealand. Under the ownership of Morningside Stud our stallions, both homebred ones and purchased ones, have been approved or licensed by studbooks around the world over two dozen times. Our mares were born into the Anglo European, Baden-Wuerttemberg, Holsteiner, Irish Sport Horse, KWPN, and Warmblood Studbook of Ireland (WSI) studbooks. As of 2009 we register all our showjumping-bred foals with WSI and other foals with the KWPN; in the past we have registered foals with Anglo European, Belgian Warmblood, Irish Sport Horse, Trakehner and Zangersheide studbooks. We have bred more exciting prospects purchased by international showjumping, international eventing, and international dressage riders throughout Europe, the United States, and South America that will be started in sport in the next few years. Our homebred young horses can be found throughout the world: Ireland, Northern Ireland, England, Wales, Scotland, Germany, the Netherlands, Belgium, France, Uruguay, Argentina, Brazil, and the United States. In the last few years we have been retained as consultants by clients seeking breeding advice, planning the development of breeding programs, and looking for competition horses. We found for a talented teenage eventing rider in the USA, Callie Judy, a mare here in the Ireland named Irish Odyssey on which Callie, a year later, won the Individual & Team Gold Medals in the North American Young Riders Championship. We also sold to South America a filly foal named Ballycullen P'Compadre that was in 2009 the 7-Year-Old Vice-Champion Showjumper in Argentina with international rider Matias Albarracin, placed 16th in the 2011 Pan-American Games, and qualified for the London Olympics in 2012.